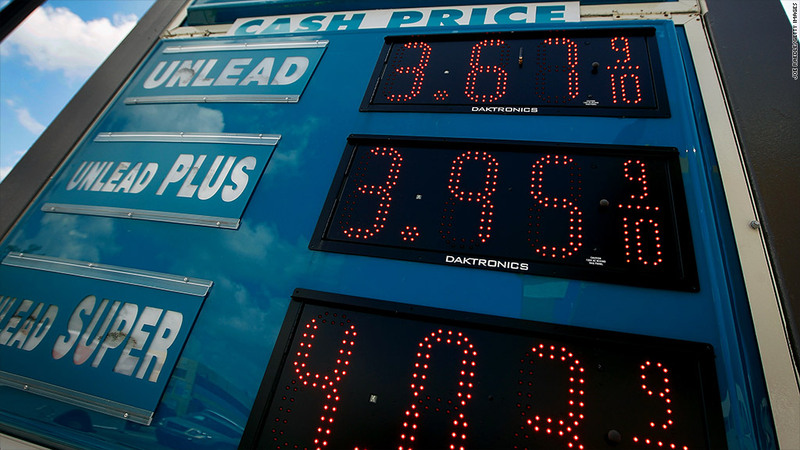 Gas prices are rising -- especially along the Gulf Coast. Click on photo for prices in your state. Gas prices continued to climb -- particularly along the Gulf Coast -- as the approach of Hurricane Isaac forced the closure of many oil and refining facilities. A survey for the motorist group AAA showed that the national price for a gallon of regular gas crept up 0.6 cent to $3.756 on Tuesday. But sharper rises were recorded in the Gulf states preparing for the storm, with gas jumping 2.5 cents to $3.642 a gallon in Louisiana, a little more than 2 cents to $3.563 in Mississippi, and 1.3 cents to $3.581 in Alabama. Tom Kloza, chief oil analyst for the Oil Price Information Service, which tracks gas prices for AAA, estimated that the national average could shoot up by 10 cents due to the disruption to supplies from Isaac, although he expects a fairly quick retreat if there is no lasting damage from the storm. Even before the storm, prices had risen about 7% this month, to the highest levels since early May. But the storm has added to the climb, taking the national average up 2.6 cents since Friday, when Isaac's path first appeared to veer away from Florida toward the oil and gas facilities in the Gulf of Mexico. More than 1.3 million barrels of daily gasoline refining capacity in the region was shut down Monday ahead of the storm, which is expected to be upgraded to hurricane status later Tuesday. Phillips 66 (PSX), Valero (VLO), Marathon (MRO) and Exxon Mobil (XOM) were among those shutting down refineries as a precaution. Motiva Enterprises, a joint venture between Royal Dutch Shell (RDSA) and Saudi Arabian Oil that operates four refineries along the Gulf Coast, was running those facilities at reduced rates in preparation for the storm and has also shutdown a pipeline in the area. The National Hurricane Center declared Isaac a hurricane Tuesday. It is expected to reach the Gulf Coast sometime late Tuesday or early Wednesday. A hurricane warning was in effect for areas east of Morgan City, La., to the Mississippi-Alabama border. The region includes metropolitan New Orleans and much of the nation's refining capacity. The refineries were the only oil facilities shut down in advance of the storm. The federal Bureau of Safety and Environmental Enforcement reported Monday that more than half the rigs and platforms in the Gulf of Mexico had evacuated their crews. That, in effect, shut down nearly 80% of oil production in the Gulf and nearly half the natural gas output. Oil futures rose 75 cents $96.22 in trading Tuesday. Gasoline futures -- the wholesale price paid by companies that use or resell gasoline -- fell, after being up as much as 2 cents a gallon earlier in the day. The September contract dropped 5.7 cents to $3.098 a gallon, while the October contract slipped 4.4 cents to $2.906 a gallon.